Millions of tourists visit Dubai each year, over 15 million alone in 2015, and while many might be on long layovers or short weekend trips, there are certain things every visitor must see on any Dubai tour, so here they are. No trip to Dubai is complete without getting OUT of Dubai. Dubai is set in one of the most vast deserts on Earth, and anyone flying into the shining city will notice the stark contrast in landscapes from the endless sand to the bustling city. While so many visitors choose to stay in a luxury hotel and spend their time in the malls and restaurants, a Dubai tour to the desert is a must do. Companies like Arabian Adventures and Arabian Night Safari regularly run Dubai tours to the desert complete with hotel pick up and drop off, dune bashing and a meal under the stars - a must do on any trip to Dubai. Dubai might be the most impressive modern wonder when it comes to sheer size and complexity when it comes to all the city has accomplished over the last 20 years, but without getting outside the city limits and understanding the desert it is surrounded by you're really missing out. Let's face it, Dubai is known for its glitz and glamor and many visitors to the UAE want to experience feeling like a celebrity during their time here, which we can all understand. While not every Dubai tour includes our favorite top spots, if you plan your time right and do it your own, we have some suggestions on the best places to feel like a celebrity, aside from going to the best malls in Dubai. Everyone wants to go to The Palm and the Burj Al Arab, right? First off, you can't just walk into the Burj Al Arab and sit down at their private beach, so unless you want to dish out some serious cash on a reservation, all you'll be doing is driving past it. But what about The Palm? Sure, Dubai from a seaplane looks amazing, or a tall building, and that's about the only place you'll be able to see the impressive shape of The Palm island from anyway. That being said, there are some amazing beach clubs on The Palm that will make you feel like a celebrity and many close by that are just as good. All of the luxury hotels on The Palm have beach clubs, and some of the beach clubs in Dubai are Cove Beach, RIVA, Eden, Nasimi Beach and Jetty Lounge. 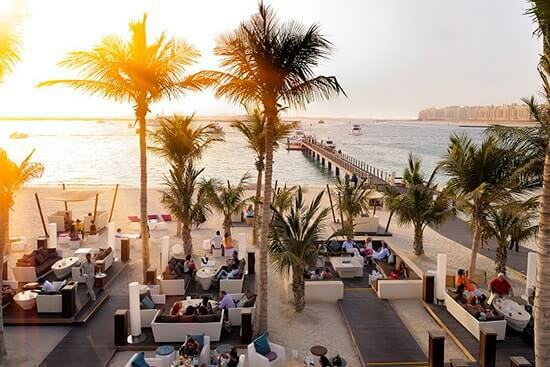 However, two of the most popular beach clubs in Dubai (and the world) are just off The Palm. Barasti is one of the top 10 beach clubs in the world and Zero Gravity is a favorite among Dubai expats and visitors year round. Ok, so we know Dubai is home to some of the most expensive and glamorous activities imaginable but what about the most fun and exciting? If you visit Dubai you're probably prepared to spend a couple bucks during your time here and if you want to spend those hard earned dollars on some of the most thrilling activities imaginable, you'll run out of time to do everything available. Ski Dubai is a popular tourist spot in Dubai, and rightly so. Housed inside the Mall of the Emirates, Sky Dubai is the largest indoor ski slope in the world and is complete with a giant ski lift, children's rides, a ski chalet and even penguins. Some say its a bit over the top but if you're here, you've got to at least head down the slopes once. Prefer the outdoors? No problem. Dubai has two of the most fun water parks we've ever been to in Aquaventure at Atlantis and Wild Wadi. Only a 10-minute drive away from each other, you won't be disappointed in either as they both provide endless outdoor summer fun on any Dubai tour. Want to dive in all the way to some water sports? Dubai offers a ton of water sport options few realize are available like SUP, jet skis, wake boarding and even flyboarding - which we absolutely love to practice when we get the chance. No trip to Dubai is complete without eating your weight in food, and the UAE offers some of the best restaurants for thousands of miles in any direction. Some of the top chefs in the entire world have relocated to Dubai to offer their skills at restaurants ranging from Japanese, Indian, Thai, Lebanese and everything else you could ever imagine. Dubai is a cultural melting pot, with over 92% expats making up the 2.5 million person population which means there are endless new and exciting foods to try no matter what your style is. The best brunches in Dubai are well known the world over to be over the top and offer the most extensive and endless spread of food and drink you could ever imagine. Vast rooms filled with seafood, sushi, deserts, open bars, roasted meats, etc are available at nearly all top hotels in Dubai any Friday of the year and are an extremely popular destination with expats and Dubai tourists alike. Far too many tourists visit Dubai without visiting the old part of the city, which is a total shame. The Dubai Creek is the oldest area of Dubai and is an absolute must visit on any Dubai tour. Hopping over to the creek you'll pay just 1 dirham to take a short ride across the river where you can easily get lost inside the endless passageways of the gold souq and the spice souq, which highlight much of the culture and history so few tourists experience in Dubai. Just a short walk away is the Dubai fish market, which is an excellent way to see all of the amazing seafood arriving daily to the city and sold to all of the top restaurants across Dubai. If you are on the Dubai Creek side of town think about taking a Dubai seaplane tour as well, which will give you the absolute best view of Dubai from the sky with hands down the best views of downtown, the Palm, world islands and the desert.